Tomorrow, Thursday morning, we set off on a family trip like none we’ve ever undertaken. We are going to Burning Man. That of itself is not a particularly big deal: my teenage son Campbell and I have been there four of the last five years. But this year we are going as a whole family, in part because wife Posie and 7-yr old son Noel indicated themselves as ready and enthusiastic to attend, and in part because this may well be the only time we can do so: presuming that Campbell starts college next year, it’s almost certain his first weeks will overlap with Burning Man 2013. This is, therefore, probably be the only occasion that the four of us will ever get to embark on a trip like this together. Because the thought of the four of us camping on the desert floor – in high temperatures, with high winds, with everything going on around us at high volume and at high energy levels causing high amounts of stress – didn’t seem quite enough for a rare four-person family vacation, we have decided to cross the country by road. Yes we are insane, but only to a degree. 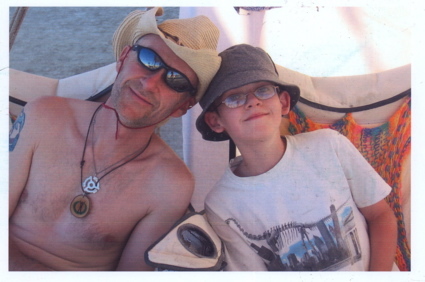 Flights are expensive, in case you haven’t noticed, but more to the point, whereas Campbell and I have been able to fly light to Burning Man these last few years and rely very much on the kindness of our neighbors at Kidsville, that is not an option with a four-person family. This year, we are bringing a shade structure (the construction of which has provided its own merry saga over the last week or two), a table, chairs, cooking equipment, two tents… How we are going to get all of this into a Toyota Highlander with only a roof-top container for additional loading space I am not yet sure, and departure is in under 15 hours. 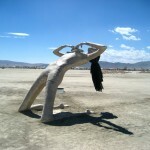 Burning Man, it should be remembered, is not a vacation destination. It’s an exercise in extreme self-reliance. It’s meant to be hard work. And it already is. Which means it’s going precisely to plan. Fortunately, the journey out to Burning Man is not designed as a race against time; it’s been planned to take in some serious sights. As you can see by following the lettered destinations on the Google map, we will be stopping off in Virginia (to see a couple of Posie’s siblings), and spending Saturday night in downtown Knoxville, where a concert by the Bar-Kays in the World’s Fair Park should set us up nicely for the next two nights in Memphis. There we will pitch tent at the Graceland campground, tour Elvis Presley’s abode (which I visited on my first trip through America in 1987, and I can still vividly recall one of the green carpeted walls! ), and then take in tours of the Stax Museum, Sun Records and hopefully the National Civil Rights Museum as well. From there it’s a rather daunting two-day journey across Alabama, Okahoma, northern Texas,and New Mexico into Arizona and the Grand Canyon, where we will pitch tent again and gaze out and into one of the great wonders of the world. Left to my own devices, I would probably put the hiking tent on my back and head down into the Canyon itself for what I’m sure would be a cosmic experience, but with family in tow, we will resume traveling after a two-night stay, on to Las Vegas for Saturday night, into Reno for Sunday, and out into the Nevada desert and Black Rock City – aka Burning Man – the following afternoon. By that point, we’ll have taken in over 3400 miles, and will no doubt be glad to leave the car parked next to our tents for seven days while we give ourselves to the carnival of mind and spirit that is Burning Man. 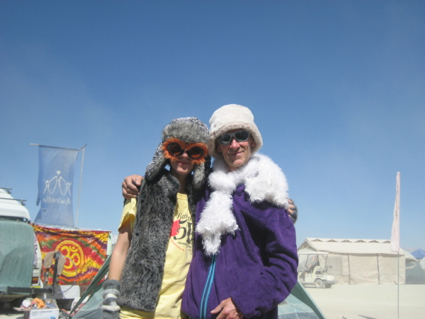 Word has it that last year’s mild weather is already a thing of distant memory, and we are prepared for serious dust storms and the prospect of 60,000 people, many of them (like Posie and Noel) attending for the first time, losing their s**t – in the nicest possible way. 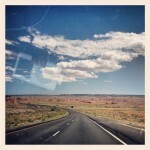 It’s my intention to report on the cross-country trip as we go, though in what format I haven’t yet decided. Oh yeah, it’s also our intention to return home by car as well (though Campbell is flying back to avoid missing school). That, however, is most certainly another story. Really pleased that you have taken the daft decision, Tony! Your trip will be immense fun…have a good one. The trip looks really awesome and I am so excited about the new book. When I was 9 my family packed up and went cross country and it was a great experience I remember to this day. America is beautiful. Thanks Gary. I’m hoping Noel, at least, will appreciate the trip in years to come. (Campbell is that much older and didn’t do the return leg with us.) America really is beautiful – and so remarkably different in one area from another. And glad that you’re looking forward to the book as well.